This show aired two days after The Boys allowed Lehman Brothers to fail. And that is what happened, they chose to let it go. This day catapulted the “economy” into what we now know as The Great Recession. 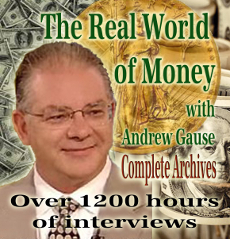 Hear our man, Andrew Gause explain succinctly exactly what went on and why. Guaranteed you’ll not hear this accurate analysis anywhere but here. Why was the dollar making gains the last 45 days? How to hedge your 401Ks and other retirement accounts is covered here. What is coming? and what is the dollar going to be worth a couple of years from now? Hear the real story now and pass this link on to everyone you care about. I am happy that you are continuing to play some of the best of The Real World of Money. I’m not ready to let go just yet. Thanks again Patrick.